The return journey is always bittersweet; the anticipation of seeing loved ones back home, and yet the heart becomes restless as the airport slowly looms in the horizon. Is this my last visit here? Are all of my sins forgiven? Are all of my deeds accepted? Have I truly tried and done enough? And with each question, the heart responds with a sense of longing, hoping, and worrying. For the fact of the matter is, nobody knows, and nobody can claim piety upon oneself. So we place our hope with Ash-Shakoor, the One who accepts imperfections from those who are imperfect, if He wills. But the most important question that the Hujjaj should ask is: Will I remain istiqamah after this? Hajj Mabrur does not necessarily mean it’s attained just by completing the manasik, but it means to remain true and consistent on Tawhid, on the Sunnah, in Taqwa, in righteous good deeds, in obeying what has been commanded and what has been prohibited, and in the removal of everything that gets in the way between your relationship with your Rabb – just like your father, Ibrahim AS. Here I am (I commit myself to serve You and worship You), O Allah, here I am. The talbiyah reminds us of our focus – and that is Allah, and Allah alone. So will we leave Makkah with our lives changed? Because living by this statement means we’ve committed ourselves to Allah, we’ve intended everything for Allah, in every moment of our lives, in everything that we do – our work, family relations, friends, what or where we choose to work, to live. Everything. Hajj is not about getting the title ‘Pak Haji’. Hajj is not about striking it off on your To-Do-List. Hajj is not just about completing the manasik. Hajj is not about returning home and to our old ways – be it of immodest fashion and lifestyle, to haram relationships, to unguarded gaze, to unrestrained tongue, to be lazy in ibadah, to be impatient when tested, to be immersed in entertainment, to each and every single bad habit and bad character that we have vouched that we will never return to. You were a guest of Ar-Rahman, you were invited by your Rabb, you did not arrive there by your own. So will you repay the honour and kindness by returning to your sins? O Hujjaj, remember how patient you were, so continue to be patient! Remember how steadfast you were, so continue to be steadfast! Hajj is about being consistent. This is why I personally feel that the Hujjaj have a greater amanah towards their Rabb upon their shoulders. Allahumma, grant us all Hajj Mabrur, and allow us to return again and again to the Haramain, and help us remain istiqamah until the last of our breath. Allahumma, there is now a distance between us and Your House, but do not make our hearts distant from You, for you are the same Rabb that we worship, and the same Rabb that we will return to. The heart yearns to return, so make our hearts yearn to return to You in the best state that is most pleasing to You. [Hajj Tips] Are Sins done in Makkah multiplied? Question: Are sins performed in Makkah multiplied? If so, how are they multiplied? Meaning, the punishments for those who perform sins in Makkah are more severe than the punishments for those who perform sins outside of Makkah. 💎 It is Sunnah to rest on the day before ‘Arafah. Try getting your rest as much as possible because THE MOST important day of your life is the next day, ‘Arafah, and the most important pillar of Hajj. It is Allah’s Mercy that ‘Arafah is the beginning of Hajj. If you have not yet planned all of your supplications for ‘Arafah, this is the time to do so. 💎 It’s best to pack up your items in advance before heading to ‘Arafah because we want to be there as early as possible. 💎 Wuquf at ‘Arafah technically begins at Zuhr. So upon reaching ‘Arafah, take the opportunity to rest / sleep before Zuhr. We want to feel refreshed and save our energy as much as possible for those 5 critical hours in ‘Arafah. 💎 It’s not recommended to go to Masjid Namira as you will waste a lot of time getting in and out of the crowd. Stay in your tent and rest, so that when the time of ‘Arafah comes, you’re set to go. 💎 Rasulallah ﷺ said “All Arafah is Arafah”, so don’t be fooled by anyone leading you to a “more barakah spot / mountain”. It’s a common mistake to join the crowd at Jabal Rahmah to perform nawafil prayers – there’s no dalil from Rasulallah ﷺ regarding this. Stay close to your tent so you don’t get lost. 💎 Listen carefully to the Khutbah of ‘Arafah and don’t talk during it. It’s not like Jumuah khutbah, but it is Sunnah, so make sure you take advantage of these moments. 💎 Pray Zuhr and Asr combined and shortened with 1x adhan and 2x qamat, without nawafil prayers in between – this is the Sunnah. Notice that this is the ONLY DAY of the year that Rasulallah ﷺ prioritized du’a to solat, i.e. pray Zuhr + Asr as soon as Zuhr comes in, combined and shortened, then spend the rest of the time making du’a until Maghrib. 💎 When the time of ‘Arafah begins, it’s sunnah to wuquf in the direction of the kiblah and raise your hands when making supplications. The hands of Rasulallah ﷺ did not come down EVEN ONCE until Maghrib (except when he was asked about whether to fast or not). Remember that this is THE MOST IMPORTANT block of hours in your entire life. Don’t waste a single moment of these hours by chit-chatting, sleeping etc! Do a lot of istighfar, tawbah, dhikr, supplications, as well as salutations and prayers to Rasulallah ﷺ. 💎 It is Sunnah to wuquf and make supplications outside the tent in the sitting position, because this was the way of Rasulallah ﷺ. So if it’s possible, especially in the last hour, make your supplications outside. 💎 Prioritize first supplications from the Qur’an and from the Sunnah. There are no better and concise supplications than these. Rasulallah ﷺ loved to repeat his supplications 3 times. 💎 Divide these critical 5 hours for specific supplications – for example, the first hour is reserved only for yourself to make tawbah and personal supplications. Prioritize tawbah before all other supplications. 💎 Then supplications for your spouse; make du’a to Allah that he/she is among the soliheen, who preserve their chastity and modesty, guard their solat, love to go to the masaajid and knowledge circles, love to read and ponder over the Qur’an and so forth. 💎 Then the next is for your parents; make du’a to Allah for their health in the physical and spiritual sense, for husnul khotimah; and if they have passed away, ask for their forgiveness, for Allah’s Mercy upon them, for sakinah in their graves, and so on. 💎 Then the next is for your children and do not generalize your du’a, rather make individual du’a for each child because every one of them has their own struggles. 💎 Then the next is for your siblings, then your other family members, friends, teachers, and the ummah at large. Never forget to include the ummah in our du’a. 💎 There is no basis for congregational / group du’a in ‘Arafah, so make your supplications individually. If you ran out of du’a, make dhikr as taught by Rasulallah ﷺ – “The best thing I and the prophets have said on the eve of ‘Arafah is Laa ilaaha ila-Allah wahdahu la shareeka lah, lahul-mulku wa lahul-hamd, wa huwa ‘ala kulli shay-in qadeer.” [refer Hisnul Muslim #119] So if you have time when walking towards the washroom / getting water, constantly recite this to keep your lips busy with dhikr throughout your time in ‘Arafah. 💎 In that last hour, return to those supplications you personally feel important, and increase the intensity of your supplications with khushoo’ and tawadhu’ until Maghrib – spend that last hour outside of your tent if possible. May Allah s.w.t. help us to fully utilize these moments in ‘Arafah, forgive all of our sins and accept all of our supplications. Allahumma ameen. Rasulallah ﷺ said that Hajj is ‘Arafah. Why? Why specifically ‘Arafah, when there are other Hajj manasik that must be done? Why is the time specifically between Zuhr until Maghrib on the 9th of Dhul Hijjah becomes more important than the rest? ‘Arafah is calling upon Allah. ‘Arafah is turning to Allah. ‘Arafah is about making sincere tawbah to Allah. ‘Arafah is THE time to make supplications like we’ve never done before. They’re not supplications like we make when calamities hit us, when it’s easy to call upon Allah out of desperation. They’re not supplications done at our convenience. But they’re supplications done because Allah s.w.t. has commanded to do so – for five hours straight. And this is the trial for the hujjaj. There are those who stood and wept in ‘Arafah not because from making supplications, but because they came unprepared. Five hours can be a very long period of time for the unprepared. But if you come prepared, then that time is extremely short. There are so much to repent from. So many sins to ask for forgiveness. So many shortcomings that need to be rectified. So many requests to ask of – for a long-lasting iman and taqwa, for becoming a muhsin, for becoming one of the ulul albab, for becoming from the foremost of the foremost, for His rizq and barakah, for His help against the whispers of shaitan, for His help in all affairs, for istiqamah on the Straight Path, for husnul khotimah, for protection from the torments of the grave and Jahannam, for the highest place in Jannah, and for everything else that is khayr for our family, friends, teachers and the rest of the ummah. Prepare these supplications in advance even before going for Hajj. The first hour is reserved only for yourself to make tawbah and personal supplications. Prioritize tawbah before all other supplications. Then the next 30 minutes are for your spouse; make du’a to Allah that he/she is among the soliheen, who preserve their chastity and modesty, guard their solat, love to go to the masaajid and knowledge circles, love to read and ponder over the Qur’an and so forth. Then the next is for your parents; make du’a to Allah for their health in the physical and spiritual sense, for husnul khotimah; and if they have passed away, then ask for their forgiveness, for Allah’s Mercy upon them, for sakinah in their graves, and so on. Then the next is for your children and do not generalize your du’a, rather make individual du’a for each child because every one of them has their own struggles and weaknesses. Then the next is for your siblings and other family members, friends, teachers, and the ummah at large. Never forget to include the ummah in our du’a. Rasulallah ﷺ said du’a is ‘ibadah. Since Hajj is one of the mighty acts of worship, and ‘Arafah is du’a, then this is why Hajj is essentially ‘Arafah. Because ultimately, du’a is the essence of ‘ibadah. May we be gathered in the remembrance of Allah on the Day of ‘Arafah, and may we be chosen as those whom Allah s.w.t. praises His slaves to His angels on that day, and may we remain in this state of khushoo’ and sincerity until the last of our days. If Allah has selected you as a hujjaj this year – alhamdulillah! If Allah has yet to answer your Hajj du’a – alhamdulillah ‘alaa kuli haal (in all circumstances), because whatever Allah has ordained for us is always good for us. His blessings are not just in what He gives, but also in what He withholds or takes away. Alhamdulillah! Regardless of our circumstances, most of us know the importance of Hajj, so we long to attain Hajj Mabrur (Hajj that is accepted by Allah). Thus it is really critical for every Muslim to learn about Hajj, its manasik (rituals), and its history so that we can be prepared when that call comes, fully appreciating it and utilizing its every moment in the best manner. then he should not have [rafath], nor commit [fusuq], nor [jidal] during Hajj. And whatever good you do, Allah knows it. And take a provision for the journey, but the best provision is At-Taqwa. So fear Me, O men of understanding [Ulul Albab]! [Rafath] means sexual relation with your spouse, including anything that might lead to it, such as embracing, kissing, and talking -even hinting!- about it or any other similar topics, by both men and women. Rafath also include bad and foul words. [Fusuq] means all types of sins and disobedience, including cursing others, insulting one another with bad names, and slaughtering animals for other than Allah. [Jidal] means arguing and getting into disputes. At this point, we might be thinking that there’s no way we’ll end up doing these things during Hajj – after all, it’s a once in a lifetime opportunity. But think about it. Out of the many types of disobedience, why are these 3 things mentioned specifically in this ayah? Because Allah s.w.t. will definitely TEST US especially with these three things during Hajj. Allah s.w.t. is teaching us to not feel safe from falling into sins, because it may be due to our haughtiness or ignorance that will cause us to fall into the very sins we were so confident of not doing. If we ask the experienced hujjaj, they will say that they were tested so many times throughout the journey – confusion and disorder at the immigration, luggage went missing, bus got delayed, weather was strikingly hot, got pushed during tawaf, got bumped during sa’ie, got thrown by a pebble at the jamrah – and so many other incidents that might cause rafath, fusuq or jidal – if we’re not careful! Negative self-talk can be triggered by something so minor, and if not managed, will eventually consume the thought of that person about everything else. Even if we can be physically patient by not saying anything bad with the tongue, we can still cause damage to our sabr if we constantly do negative self-talk within ourselves. And if we do not manage those negative self-talks, then we’re allowing ourselves to be taken advantage by shaytan, and end up physically acting on those negative emotions. That’s how people end up doing rafath, fusuq or jidal. So how do we manage negative self-talk? Move away from the scene or person who is causing you distress. For example, if you’re having a hard time with one of the hujjaj, move away from him until you’ve calmed down. Bear in mind that negative self-talk can create false accusations in our thoughts – we might think negatively about a person from the way he talks or treats us, when in reality, that person has absolutely no grudge whatsoever against us. It’s not people’s flaws that we should be focusing on, but rather our own. Developing these beautiful characters must start now, ahead before the days of Hajj come. So if someone is rude to you on the road, choose to be merciful towards him, let him have the way first instead. If you’re in a conversation that is about to get heated, excuse yourself in a respectful manner, remove yourself from the scene, and then come back once you’ve calmed down. Know that these beautiful characteristics are not only important for Hajj, but they’re just as important in every aspect and day of our lives. Always, always bear in mind that things will never go 100% smoothly during Hajj, no matter what package or group we’re in. 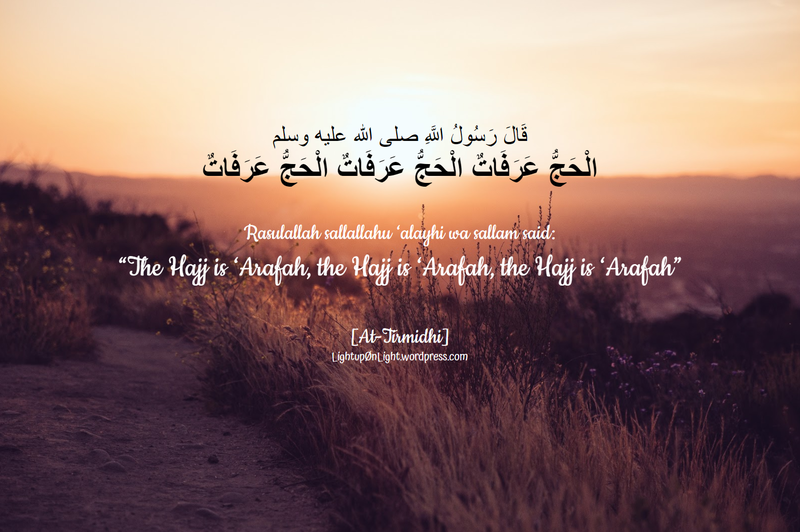 Not everything will go our way, and that is actually part of the ‘ibadah and tests of Hajj. If we want to come back to Allah s.w.t., rebuild that connection with Him with a clean slate, then there is nothing more beautiful than coming out of Hajj Mabrur completely sinless like the first day we were born. And on top of that, Rasulallah sallallahu ‘alayhi wa salaam specifically said that an accepted Hajj brings no reward EXCEPT Jannah. Subhanallah. These great rewards will not be given away to anyone so easily. So all these tests that we will face during Hajj are simply prerequisites for us to attain these rewards. Rejoice when Allah tests you, be patient when He does, and always think well of your Rabb for He is The Most Merciful and is never unjust to His creations. then he should not have rafath, nor commit fusuq, nor jidal during the Hajj. One of the wisdoms why Allah s.w.t. 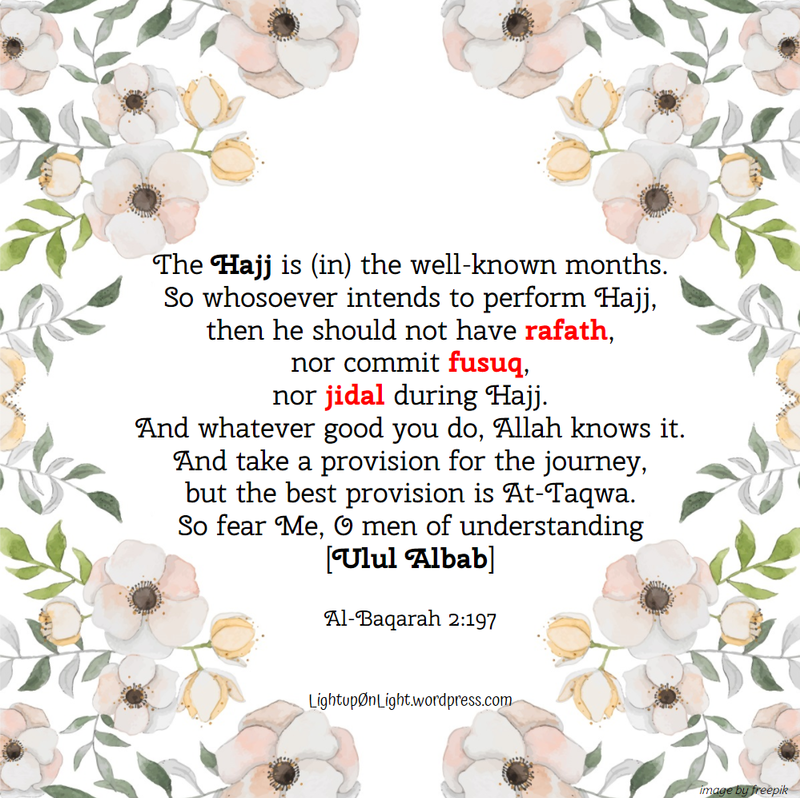 mentions Ulul Albab in this ayah about Hajj is because we must have knowledge in order to attain Hajj Mabrur, and the best of sources to attain authentic knowledge is the Qur’an and the Sunnah. Hajj Mabrur is free from shirk – and the smallest form of shirk is pride – as well as bid’ah. Every hujjaj who aspires to attain Hajj Mabrur must follow the Sunnah of Rasulallah sallallahu ‘alayhi wa sallam as close as possible to the best of their capability. Ulul Albab does not just mean people of knowledge, but they’re also people who do a lot of thinking and reflecting. Hajj is an act of ‘ibadah that requires us to do a lot of contemplation. When something seemingly bad happened to us, do not complain, instead listen to the unsaid. When we are tested, always take ourselves to account – muhasabah, seek what Allah is teaching us through that test for everything that happens has a reason and lesson. May Allah s.w.t. allow all of us to do Hajj in the best way possible that is most pleasing to Him, and grant us all Hajj Mabrur – Allahumma ameen!